Children age 12 and under stay free in the room with parents and in existing bedding. Children over this age will be considered an adult. Maximum 2 children per room. See rate rules. Exceptions may apply during holidays or special events or conventions. The hotel reserves the right to without prior notification cancel any reservation with an invalid or incomplete credit card number. Located in the bustling Al Olaya district the Boudl Al Faisaliah Hotel is an excellent springboard from which to discover Riyadh. It is a kilometre from the city centre and is well connected to the best tourist destinations in town like Kingdom Centre Tower and all the key museums. King Fahd International Stadium is close by. Discover all that Riyadh has to offer with 4 star Boudl Al Faisaliah Hotel as a base. 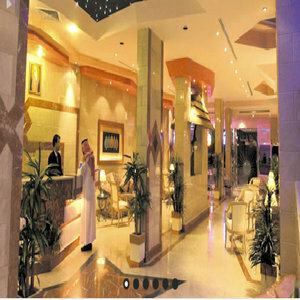 The Boudl Al Faisaliah Hotel boasts a convenient location with modern amenities in every guestroom and superb service. Each guestroom is fully equipped with in room safe- satellite- cable TV. Guests can experience the high standards of comfort while staying at this luxury Riyadh hotel with everything they need on site such as a coffee shop- laundry and dry cleaning service- salon- free on-site parking. In addition the hotel guests can enjoy the leisure and sports facilities provided on the premises- kids club- outdoor pool. Guests staying at this hotel- one of the best quality in Riyadh- will find its convenient location and tranquil atmosphere pleasurable. Additional Information: Children age 12 and under stay free in the room with parents and in existing bedding. Children over this age will be considered an adult. Maximum 2 children per room. The hotel reserves the right to without prior notification cancel any reservation with an invalid or incomplete credit card number.